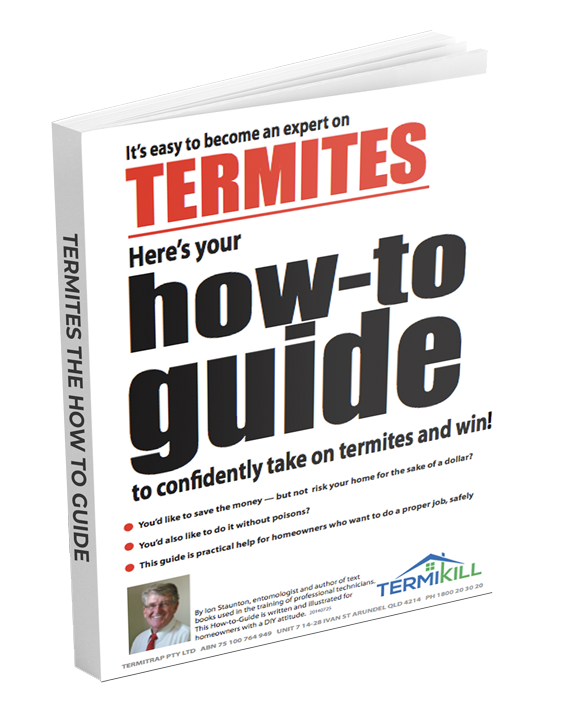 There are four main termite genera we call serious pests of buildings because they all eat (prefer) solid timber —the seasoned stuff used in houses. The Nasutes are easily identified by the pointy heads of their soldier. If these are the ones you’ve found, look around for a mound nest and physically destroy it with a pick, mattock or crowbar. 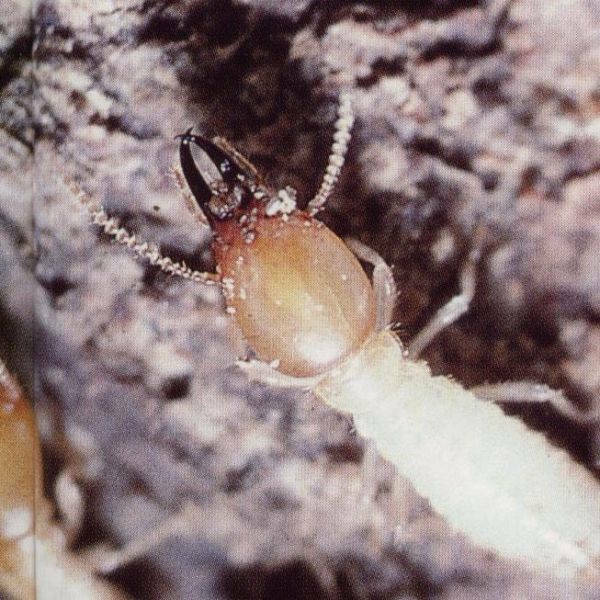 Not many people enthuse about a termite mound as a feature in their backyard so Nastutes suffer the consequences of being obvious —and they don’t rate in the serious pest category. The Mastos rate very highly as serious —but only if you live north of the Tropic of Capricorn (Rockhampton to Exmouth). 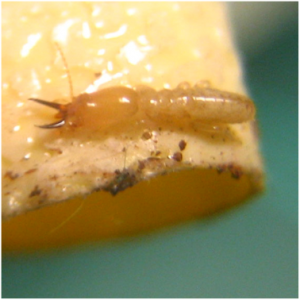 Identification is also easy: if you live in this region and the termite you’ve found is about 13-15mm long (half an inch or so) and it is eating solid wood —it is a Masto. Coptos and Schedos soldiers have brownish heads and two fang-like jaws sticking out in front. They measure 5-7mm. 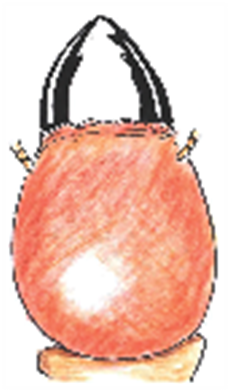 They also have a fontanelle or hole at the top front of their heads to emit a white droplet of defensive goo. 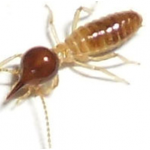 This is the main point: if you live anywhere on continental Australia; if you’ve found termites eating solid wood; if they are about 5-7mm long with two black jaws— they are most likely to be either Coptos or Schedos. 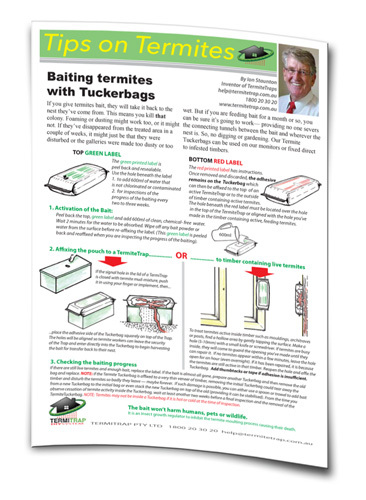 Both termites are susceptible to the Tuckerbag Termite Bait and attracted to the TermiteTraps. (There are a few species of each of Coptos and Schedos found in different regions, some with slightly different nesting habits). 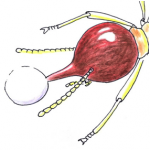 We won’t suggest use of our Bait or TermiteTraps on anything other than Coptos and Schedos. 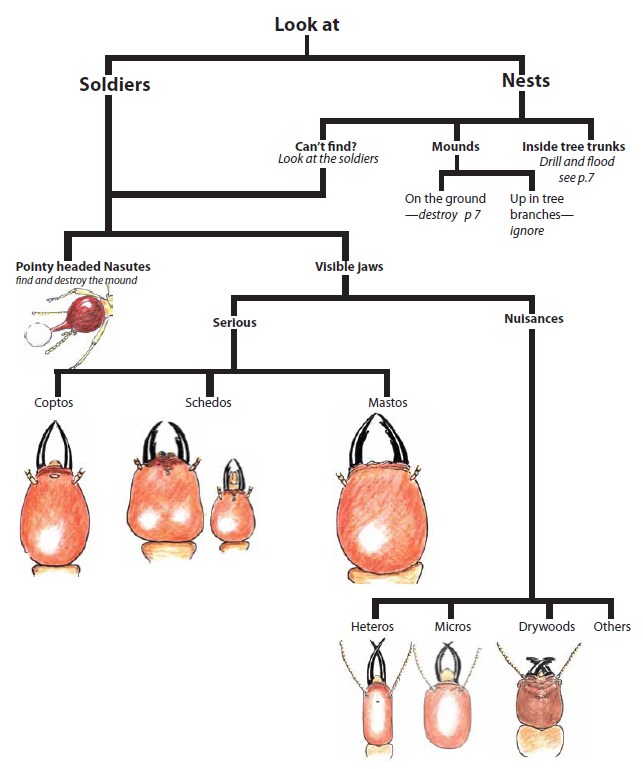 The Mastos are certainly attracted to the TermiteTraps but the bait is ineffective. If the customer in Mastro territory can’t get Fipronil insecticide or a pestie to dose the Trap, they shouldn’t buy the TermiteTraps. 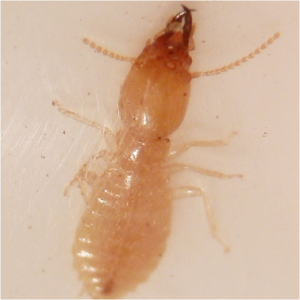 Background info on the not-so-serious termites? 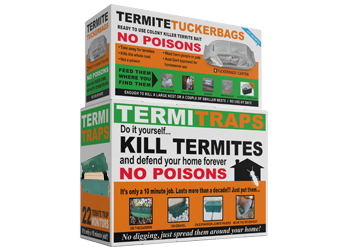 We don’t recommend using our Bait or Traps for any other termite. However we will give advice. The Nasutes (brown pointy heads, no black jaws) always build mounds. There are other mound builders that have black-jawed soldiers (often smaller than 5mm) so if you’ve found some like these in garden mulch, fences or retaining walls, check for mounds to a radius of about 30-50 metres. 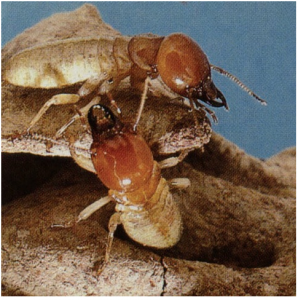 Some of the less serious termite species do not build mounds but nest below soil level or behind retaining walls. The Hetero (left) doesn’t normally build a mound. Sometime behind retaining walls or in a large planter pot, carring potting mix high in wood fibre. Will nibble at solid wood but it takes a long time to do not much damage. Note the long cylindrical head and toothless jaws. Copto : Found all around Australia. 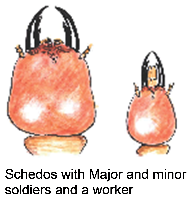 Avocado shaped heads, jaws without teeth, may emit white globule. About 7mm long although a couple of Copto species are smaller… about 4-5mm long. 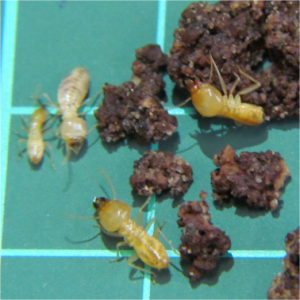 Mastos : North of the Tropic of Capricorn, no other termite in this region is as large at 13-15mm. Microcerotermes (Micros): Represented by at least one species over all Australia, some of which build mound in the ground, atop posts, on the side of trees. Mostly leaf-litter and grass eaters but some will eat sound, decaying or weathered timber. Drywoods (Cryptos): Mostly found along the more tropical coast although Cryptotermes austrinus is found in central Australia. Solider heads are almost vertical at the front with short broad jaws with teeth. They do not need contact with the soil for moisture. Small colonies; may be in furniture, even picture frames or ornaments. Others : There are even big ones that eat decaying timber, small ones that eat grass. In fact there are another 300 species we haven’t covered. You’d have to be pleased we decided not to confuse you with a full description of them all.